Chloe* is a lawyer at Lenczner Slaght. She has experience in commercial and professional liability matters and looks to develop her practice in a range of areas. In her downtime, Chloe enjoys being active. With a keen interest in martial arts, Chloe matches§ punch for punch on and off the court while remaining cool under pressure, which has earned her recognition. While at law school, Chloe participated in the Wilson Moot, winning best team and best factum. This is a result of Chloe’s ability to combine her legal passion with judgment‡ when approaching every case. She also expresses her passion for law by giving back to the community. She has volunteered at University of Toronto’s student clinic, the Pro Bono Law Ontario Office at SickKids, and the Indigenous Law Journal. 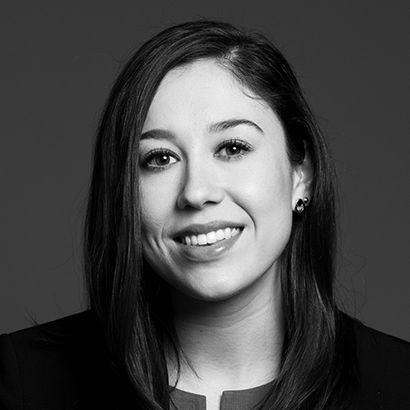 Chloe also worked in Iqaluit where she contributed to an Access to Justice initiative. .
As an articling student at the firm, she gained experience through commercial and professional liability matters and continues to build a developing practice in a range of areas. She also completed a secondment at the Bank of Montreal. After her first year of law school, Chloe worked in Iqaluit. While there, she contributed to an Access to Justice Initiative through her work at the Law Society of Nunavut. The initiative required her to reach out to stakeholders across the territory and travel remotely. She also undertook research to assist in the negotiation and implementation of the Nunavut Land Claims Agreement while at Nunavut Tunngavik Inc.
At law school, Chloe volunteered at University of Toronto's student clinic and the Pro Bono Law Ontario office at SickKids. Chloe also represented the University of Toronto at the 2015 Wilson Moot, where her team placed first in the competition and won best factum. She was also on the senior editorial board of the Indigenous Law Journal.